►Registered site users can sign up for many of our shoots online. ►A “Members Only” page will soon be posted on the site, offering discounts and savings on archery equipment, services at area pro shops, discounts on popular bow hunting magazines, and other money saving offers available only to registered users. We do not share your information with any third party, period. Other registered members are not able to access our user list for any purpose. 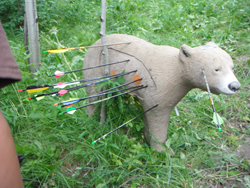 All communications with registered users come from the Pocatello Field Archers. The only required information is your name, a username, and e-mail address. ►“Members” receive both notices of shoots and other events, and communications relevant to members of the Pocatello Field Archers. ►“Non-Members” receive notices of shoots and other events, but do not receive communications that are of interest only to members of the Pocatello Field Archers.